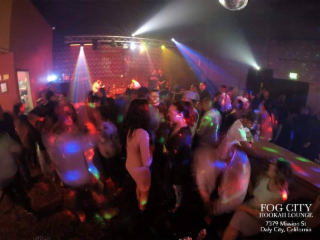 Fog City Hookah Lounge and Bar is Daly City's Premier Hookah Lounge, & Night Club with a Full Bar. Full Bar, Hookahs, Shisha, Mediterranean Grill, Sports Bar Finally a hookah spot in Daly City! Good place to relax and chill from 5 to 8pm, but once it hits 9pm, that's when the party starts with DJ's and dancing!